The yacht charter destination Balearic Islands is the most popular saiing area in Spain. There are 61 harbours with about 20.000 mooring lots in the Balearics; over 70 Yacht Charter Balearics companies offer sailing yachts and motor yachts of all makes and sizes. The latest yacht types for Yacht Charter are usually introduced in the Balearics into the Yacht Charter service. The Balearic Islands of Majorca (Mallorca), Menorca, Ibiza and Formentera feature very different aspects. Altogether there are about 550 nautical miles of extremely divers coastal line waiting for Yacht Charter Balearics crews. This is not counting the additional islands like Dragonera and the Cabrera Archipelago, a very popular destination for yacht charter Balearics cruises. As a general rule the anchoring ban on the Balearics is being extended to protect the sea grass meadows but large buoy fields make up for it. Yacht Charter Balearics tourists can make reservations for the buoys in advance. The climate is temperately subtropical, the sailing season lasts for almost the whole of the year but the months between April and November are mostly relevant for Yacht Charter Balearic Islands tourism. For the ones interested in circumnavigating the islands: due to the prevailing wind direction it is advisable to round Majorca counter clockwise; Menorca on the other hand is rounded easier in a clockwise direction. Yacht charters Mallorca / Majorca: Majorca is famous for its great mix of bays, sandy beaches, marinas, multifaceted and different landscapes, culinary delights and culture – and for its vivid yachting scene, that extends far above the Yacht Charter area and has attracted yacht owners from all over the world. 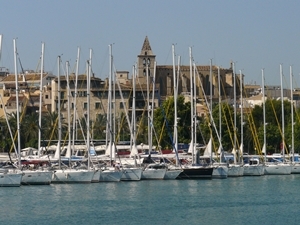 Often the bay of Palma is the venue for various famous international regattas. Starting port for most yacht charter Balearic Islands cruises is Palma de Mallorca with the widest range of charter yachts in Majorca and several different marinas and yacht harbours. “Ciutat”, this is how the Mallorquines call their main town, invites yacht charter Mallorca crews to a long stroll through the old town, to a visit of the Cathedral “La Seu”, to more sightseeing and of course to shopping and nightlife. Other yacht charter Mallorca bases, which offer mainly sailing yachts, are in C’an Pastilla, a surburb of Palma on the Northern end of the famous Playa de Palma, in the big bays in the North of Majorca in Puerto de Pollensa and Puerto de Alcúdia, in the East in Portocolom, in a picturesque bay often called Bahia Azul (the Blue Bay), and in Cala d’Or. Motor yachts and luxury yachts with crew can be chartered as well in in the Southwest, in the elegant port of Puerto Portals or in Port Adriano, which has been extended with new berths for superyachts. For overnight stops, yacht charter Majorca crews like as well the yacht harbours of Sa Rápita in the South, Porto Petro, Porto Cristo (nearby the caves of Drach are worth an excursion), Cala Ratjada with a lot of nightlife at the Eastern coast, picturesque Port Soller at the West coast and Santa Ponsa in the Southwest. For anchoring or swim stops, there are a lot of beautiful bays at the South and East Coast, the bays of Palmanova and Portals Vells in the bay of Palma, or St. Elm opposite to protected Dragonera island. 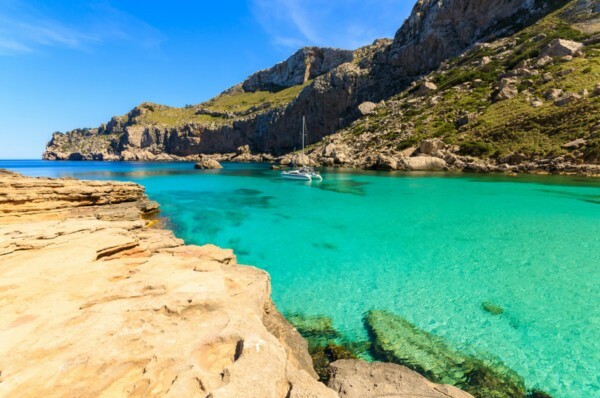 One of the hiighlights of many Majorca yacht charter cruises is an overnight stop at the nature reserve of the Cabrera archipelago in the South of Majorca. Yacht charters Menorca / Minorca: The Yacht Charter Balearic crews in search of solitude should sail to the slightly rougher sister island of Menorca / Minorca, or charter their sailing yacht or motor yacht directly on Menorca in Mahón / Mao. Yacht charter Minorca crews will enjoy not only beautiful landscape and picturesque bays, but will discover as well the interesting towns of Mahón and Ciutadella. Yacht charters Ibiza & Formentera: The yacht charter destination Ibiza is known as the embodiment of party culture and shows its closeness to Africa with its white Ibizan architecture. The party is on in Ibiza town and in many noble beach clubs. But here is more than only party life: Ibiza has a lot of very nice bays and white sandy beaches, and picturesque villages. You can charter yachts in Ibiza / Eivissa town (there are several marinas: Ibiza Magna, Ibiza Nuega, Marina Botafoch), in Port San Antonio – with the best range of sailing yachts in Ibiza – and in Santa Eulalia. Formentera attracts yacht charter Ibiza crews with dunes and beaches. The flat island houses only one harbour among its dunes, but also some idyllic anchor bays and beaches that have owned her the nickname Caribbean of the Mediterranean Sea. Between Ibiza and Formentera (called together as well Pitiuse islands), you’ll find the Archipelago of Espalmador. The great bay Puerto de Espalmador is a popular anchorage ground among many sail and motor Yacht Charter Ibiza captains..
For groups, sailing events and incentives in Majorca and Ibiza, there are several big sailing yachts and sailing catamarans available. 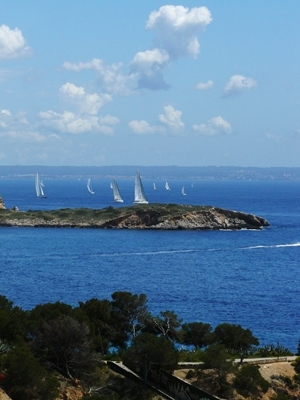 Please find here suggestions for sailing itineraries starting your charter from Palma de Mallorca: Mallorca-5-Itineraries . You can easily adapt them for embarkation at other ports like Puerto Pollensa, Portocolom, Puerto de Arenal, Menorca / Mahón, Ibiza town or Ibiza San Antonio. Or just ask for more suggestions.